DUBLIN – 5 June, 2018 – Host in Ireland, a strategic global initiative created to increase awareness of the benefits of hosting digital assets in Ireland, and winner of the Datacloud Europe 2016 award for Innovative Data Center Location, announces today that its Founder and President, Garry Connolly, will speak at Datacloud Europe 2018, taking place 12-14 June, in Monaco. During the panel session, “Finding Your Edge – What is the Impact of Emergent IT Infrastructure and Technologies on Existing Compute Delivery Models?” Mr. Connolly will join other data centre leaders to discuss how edge computing is heralded as the next great step in digital innovation and consumption, and what this means for data centre and cloud infrastructure. They will also explore how the industry must rethink existing paradigms of compute delivery, and infrastructure ownership and responsibilities. 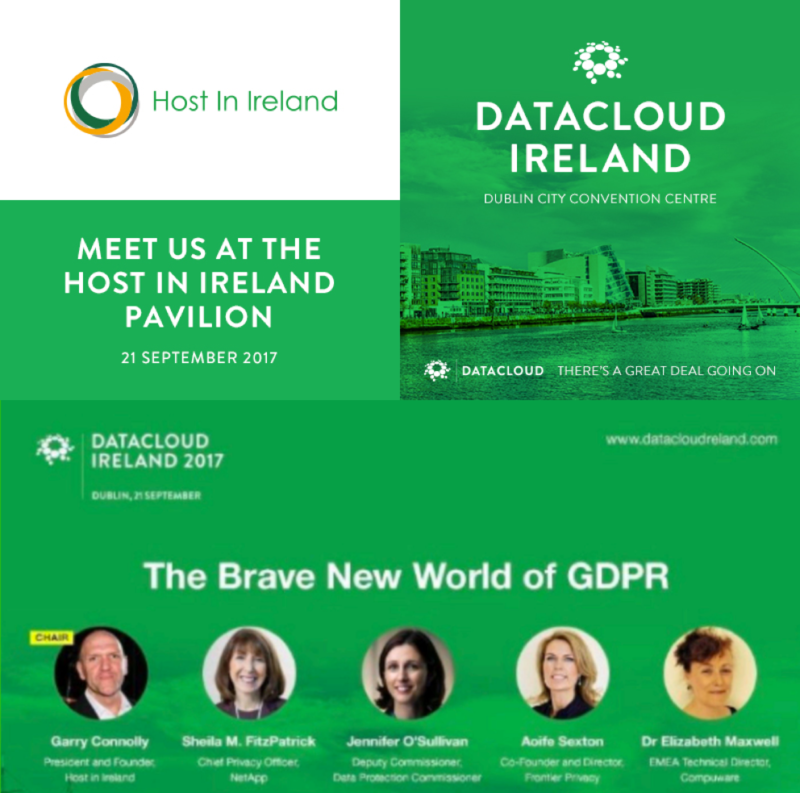 DUBLIN – 14 September, 2017 – Host in Ireland, a strategic global initiative created to increase awareness of the benefits of hosting digital assets in Ireland, and winner of the Datacloud Europe 2016 award for Innovative Data Center Location, today announces its participation at Datacloud Ireland, taking place 21 September, 2017 at the Convention Centre, Dublin. Addressing an often-misunderstood subject, Host in Ireland Founder and President, Garry Connolly, as a Special Intelligence Session moderator, will join industry experts to explore the economic benefits associated with an increase in digital assets hosting throughout Ireland. In addition, Mr. Connolly will chair a panel session discussing the impact of the General Data Protection Regulation (GDPR) on organisations throughout the region. On Thursday, 21 September, at 9:40 a.m., Mr. Connolly will join an esteemed group of national and international data protection specialists as the moderator of the Special Intelligence Session, “GDPR Mastered.” This session will explore the overall impact of the GDPR on the creation, retention and distribution of data, as well as the effects that it will have on data hosting throughout Ireland and the European Union. In addition, later that morning, at 10:15 a.m., Mr. Connolly will chair the panel session “The Brave New World of GDPR,” featuring Ireland’s Deputy Data Protection Commissioner and representatives from NetApp, Frontier Privacy and Compuware. As companies evolve to comply with GDPR legislation, these changes bring about a host of new concerns, as well as opportunities. During this session, panelists will discuss the opportunities and challenges that the GDPR will have on all global companies and their relationship with the data of EU citizens. Alongside premier partners CBRE, EdgeConneX®, Equinix, Future-tech, Keppel Data Centres, Mercury Engineering, Primary Integration and Siemens, Host in Ireland will also be a featured organisation in the “Irish Pavilion,” an exhibit focused on the advantages of the Irish hosting ecosphere. Datacloud Ireland will bring together international enterprises, local providers, investment agencies and power supply companies as a platform for networking, education and collaboration among hosting industry professionals. The forum highlights the unique value of data centre, cloud and IT infrastructure across Ireland, which has become the gateway to Europe for multinational businesses. If you would like to set up a meeting with Host in Ireland at Datacloud Ireland 2017, please email hostinireland@imillerpr.com. To learn more about Host in Ireland, visit www.hostinireland.com. The internet of things (IoT) is expected to have a huge impact on the data centre industry in terms of data, analytics and volume, and the interconnected data centre will play a starring role, says Jelle Frank van der Zwet from Interxion. Interxion recently announced it is to build its third Irish data centre on the outskirts of Dublin, which will be due for completion in Q4 2016. Van der Zwet manages the pan-European marketing and product development programme for Interxion’s fast-growing cloud community. He has more than 12 years of experience working in ICT product and business development. According to Van der Zwet, the role of data centres in IT is changing. To read the full article, view it on the Silicon Republic website here. The European Code of Conduct for Data Centres programme is a voluntary initiative managed by the Joint Research Centre (JRC), the European Commission’s in-house science service. The Code addresses primarily data centre owners and operators, and secondly the supply chain and service providers. The energy saving focus of the Code of Conduct covers two main areas: 1. IT Load - this relates to the consumption of the IT equipment in the data centre. 2. Facilities Load - this relates to the mechanical and electrical systems that support the IT electrical load. The Data Centres Code of Conduct has been created in response to increasing energy consumption in data centres and the need to reduce the related environmental, economic and energy supply impacts. The aim is to inform and stimulate operators and owners to reduce energy consumption in a cost-effective manner without hampering the critical function of data centres. Providing a platform to bring together European stakeholders to discuss and agree voluntary actions which will improve energy efficiency following European conditions such as the climate and energy markets regulations.